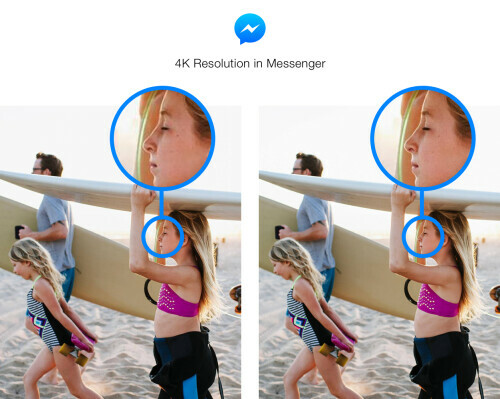 Before now, Facebook Messenger used to scale down the overall quality of sent images down to 2K resolution, but now Facebook has just announced that android and iOS users of the messenger app will now be able to send and receive high-resolution 4K images between one another. According to Facebook, the reason they added support for sending and receiving 4K images was due to multiple requests by users. "We heard that people want to send and receive high resolution photos in Messenger — and considering people send more than 17 billion photos through Messenger every month — we’re making your conversations richer, sharper, and better than ever." Although this feature is expected to be available to all users in all regions, the first wave of this new update will only be available to Messenger users located in the US, Canada, France, Australia, the UK, Singapore, Hong Kong, Japan, and South Korea. Facebook expects the implementation of sharper, richer image content to benefit the user experience in a major way. Using this new feature does not require any special settings. All you need to do is to update your messenger app on your android or iOS device and also make sure that the receiver also updates his or her device.